Managing Your Cholesterol offers up-to-date information to help you or a loved one keep cholesterol in check. The report spells out what are healthy and unhealthy cholesterol levels, and offers specific ways to keep cholesterol in line. It covers cholesterol tests and the genetics of cholesterol. The report also focuses on treatments based on the latest scientific evidence, including the pros and cons of statins and other medications, and provides the lowdown on other substances advertised to lower cholesterol. Managing Your Cholesterol can also help you work with your doctor to individualize your treatment. Eat real food. That’s the essence of today’s nutrition message. Our knowledge of nutrition has come full circle, back to eating food that is as close as possible to the way nature made it. Based on a solid foundation of current nutrition science, Harvard’s Special Health Report Healthy Eating: A guide to the new nutrition describes how to eat for optimum health. More and more Americans are working to prevent heart problems by detecting high cholesterol and lowering it. Those efforts appear to be paying off: between 2006 and 2010, the percentage of Americans with coronary artery disease—the cause of nearly all heart attacks—fell by 10%. Yet despite this decline, cardiovascular disease still is the No. 1 cause of death for men and women in the United States. One in every six adult Americans has high cholesterol, making them about twice as likely to develop heart disease as those with lower cholesterol. On the plus side, high cholesterol is something you can change. How? Healthy dietary choices and regular exercise are among the most effective weapons in the fight against high cholesterol. Medications can also help. 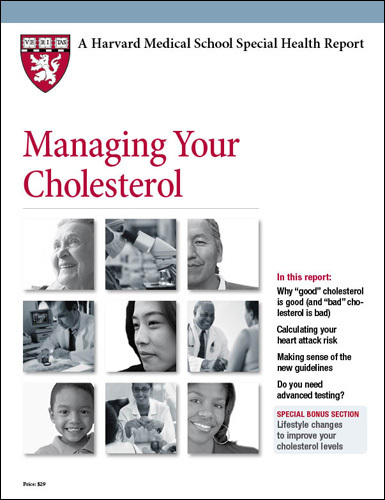 Managing Your Cholesterol, a Special Health Report from Harvard Medical School, offers up-to-date information to help you, or a loved one, keep cholesterol in check. The report spells out healthy and unhealthy cholesterol levels, and offers specific ways to keep cholesterol in line. 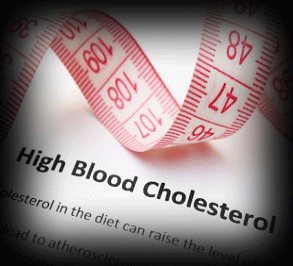 The report covers cholesterol tests and the genetics of cholesterol. The report also focuses on treatments based on the latest scientific evidence, including the pros and cons of statins and other medications, and provides the lowdown on other substances advertised to lower cholesterol. Managing Your Cholesterol can also help you work with your doctor to individualize your treatment. This Special Health Report was prepared by the editors of Harvard Health Publishing in consultation with Faculty Editor Jorge Plutzky, MD, Director of Preventive Cardiology at Brigham and Women’s Hospital. 53 pages (2016). Why did the guidelines change? Who should take a statin? A cholesterol test (also known as a lipid profile or lipid panel) measures total cholesterol, HDL cholesterol, LDL cholesterol, and triglyceride levels. You’ll get the most accurate results with a fasting lipid profile, in which you fast overnight before having your blood drawn. Though advanced testing can offer additional information, for many people it is not necessary. Because the process of atherosclerosis starts during childhood, the American Academy of Pediatrics recommends LDL cholesterol testing for all children between the ages of 9 and 11, and once again between the ages of 17 and 21. The idea is to identify the estimated two out of 10 children who have high cholesterol as a result of poor diet or lack of exercise. The goal is not to start them on statin drugs, but to identify those at significant risk, so they can be encouraged to adopt better lifestyle habits. Testing can also detect the smaller number of children (an estimated one in 300 to 500) who have very high LDL because of a genetic disorder. Children ages 2 to 8 should have a cholesterol test if they have a parent, grandparent, aunt, uncle, or sibling who has an inheritable cholesterol disorder, or who had a heart attack or stroke or needed bypass surgery or angioplasty at a young age (under 55 years in a man, under 65 years in a woman). For adults, the U.S. Preventive Services Task Force recommends cholesterol testing for all men ages 35 and older, and for men and women over age 20 with other risk factors, such as diabetes, obesity, or smoking. Men ages 20 to 35 and women ages 20 and older who don’t have other risk factors for heart disease can decide with their doctors whether to get tested. That’s because for people in these groups, the benefits and harms of treatment are so balanced that it’s not possible to make a blanket recommendation. Your total cholesterol is 200 mg/dl or more. You are a man over age 45 or a woman over age 50. Your HDL cholesterol is less than 40 mg/dL. You have other risk factors for heart disease and stroke. Getting a cholesterol test is easy. It involves having a tube’s worth of blood drawn from your arm during a routine visit to your physician. The preparation, however, takes a little effort to ensure the most accurate reading. Food and drink can affect your triglyceride level, so you should fast for 12 hours beforehand. You should also avoid drinking alcohol for at least 24 hours before the test. You can drink water and take most medications you normally use, as these should not affect the test results. If you are not sure about your medications, check with your doctor before getting the test done.